There’s something quite special about coming-of-age shows that I can’t help but love, and Violet Evergarden is one of the most unique I’ve seen. Unlike so many characters in anime, Violet grows in a way that feels meaningful: at the beginning, Violet doesn’t know what people mean when they communicate the thoughts and beliefs that color our everyday lives. She fails to empathize and express emotions; throughout the work we see her learn emotions from which she’s always closed herself off. At the beginning of the show, Violet isn’t her own person, dependent on someone else to dictate her life and give it purpose. Thanks to hardship and loss however, she’s forced to mature, to become her own person, all of this done in a way that’s incredibly impactful. All of this makes for an experience that is truly special and one of the most heartfelt I’ve seen in a long time - almost nothing I’ve seen speaks to this core element we feel in our lives, and that makes for a really magical show. That being said, what I’m going to remember from my experience watching Violet Evergarden isn’t the coming-of-age, isn’t the romance, isn’t the animation, and isn’t the characters. While those elements are great, what sets Violet Evergarden so much apart from other works I’ve seen is its emphasis on meaningful communication. While this might not seem important on first glance, it’s something that dictates so much about our lives but is rarely a focal point in media, to the point where we have entire genres dedicated to the sole act of avoiding effective communication (romantic comedy /s). We live in an age of data - there is information everywhere, to the point in which knowledge can be a hindrance in our lives, something that couldn’t be said years ago. Violet Evergarden, a show all about communication then, somehow manages to be one of the most respectful shows I’ve seen regarding communication which is rare to see. It doesn’t treat your time like something disposable; it fills your experience with substantial, engaging content, has a meaningful conversation with you, the viewer. It emphasizes this with the content in the discussion, displaying how meaningful and important information can shape so much. It harkens back to when frivolous contact wasn’t possible, and by doing this, places importance on the substantial, necessary discussions in our life. What I’m taking away from Violet Evergarden is to have more meaningful conversation as shallow, skin-deep interactions really mean nothing in the face of actual, heartfelt communication. Partially because of these elements and partially because of circumstance (thanks Netflix and school), when the show came out, I didn’t even bother watching it - I dropped the show after the first episode. Now, looking back on this, I just have to wonder: was I so burnt out that I couldn’t appreciate a show like this? While every episode might not have been necessary, all of them were incredibly well done and very engaging. The show flips a switch halfway through and becomes a roller coaster of emotions. I’m an absolute crybaby in real life and when watching anime so keep this in mind, but I cried in four separate episodes because of how touching and moving this show is, and that to me alone is a mark of quality. 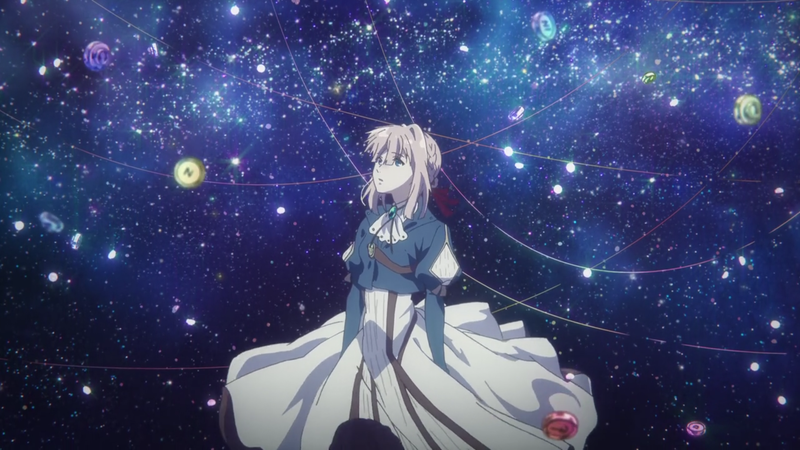 It takes a special show to move someone that much, and Violet Evergarden, while probably not one of my favorite shows due to my tastes, is at least one of the most impactful and meaningful I’ve seen. Definitely a recommendation from me if you’re interested.